As promised, now I am back with more explanations regarding this book, after we agreed on the book arts forum that I may now show off this book. As you can see it is called “water world”. 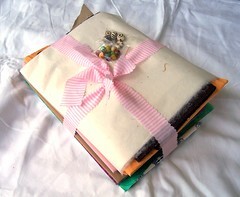 The theme for the swap was “something new” and we were supposed to use a material that we have not used before for making books and preferably a material that is rarely used for books. I had a hard time thinking of something interesting. My first attempts at making a book for the swap were maybe better when it comes to craftmanship but I hope this one is funnier and more in the line of the spirit of the swap. The rest of the design, the choice(s) of *how*to use the material inside the book are again totally mine. I chose the sew them in a stab stitch with a green leather cord, as you can see. 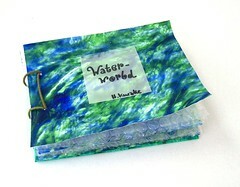 The front cover is my own paste paper (made with tapioca starch paste). 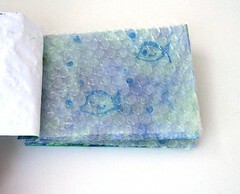 The back cover is a piece of board, also covered with green paste paper. 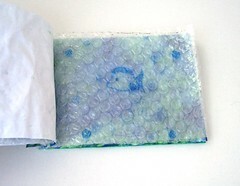 Essentially the book only has two pages each of which consists of four layers: first a piece of bubble wrap with some of the bubbles colored blue (supposed to resemble air bubbles in water like the whole bubble wrap anyway), then a layer of bubble foil with a fish (or two) sketched on them, a third bubble wrap layer with some sea floor motif (I remember drawing a sand castle but can’t remember what’s on the other page), and at last another piece of the paste paper (same as on the cover ) as background and as a separation between the first and the second three dimensional page. What interests me most about this book is its three dimensionality. Creating and using 3D in a otherwise traditional book format drives me every now and then to try new constructions. Like I started out in the book arts with making my “books with holes” and the latest piece that I also count into this category is “to touch and to cut”. I don’t know why the sea motif is important to me or comes to my mind when I do 3D books. And there is something about this book that I really like and that you unfortunately can’t experience – it makes such a pleasant sound when you turn the pages! And I like to touch and hold the book as such, with it being much lighter than the thickness suggests. Have a good start into the week, thanks for reading! Offenbar ist mein Buch für den Buchtausch “Was Neues” mittlerweile angekommen und es brennt mir unter den Nägel, es vorzuzeigen. Allerdings war der Einsendetermin erst der 15. Juni, also ist es eigentlich noch zu früh und einige wollen lieber noch gar nicht so genau wissen, was wir, die wir schon fertig sind, gemacht haben. Deswegen sage ich mal nicht mehr und zeige nur ein Bild vor. Vielleicht macht’s ja wenigstens ein bisschen neugierig. Thanks for reading and I still wish you a nice weekend! My first book after this break is a case-bound book, covered in a flannel that served me well as a pyjama for some years. The headbands are hand stitched, endpapers are sewn-on, with some decorative paste downs that I swapped with dwaallicht or Ignis Fatuus a few weeks ago. It has 320 pages from beautiful sketching paper. It feels good to be making books again! And there are more good news. I will be represented with my Smiley Orcale at Vamp & Tramp! I am not yet listed there, this will take another few days or weeks. But the ink on the contract is already drying. Of course you can continue to order it at Etsy, if you want to! Es fühlt sich gut an, nach der Computer- und Restaurationspause wieder Bücher zu machen! Das oben war mein erstes Stück seit dem. Und es gibt weitere gute Nachrichten. Ich werde demnächst mit meinem Smiley Oracle bei Vamp & Tramp vertreten sein. Jetzt muss ich nur noch die KSK (Künstlersozialkasse) davon überzeugen, dass das ein Beweis meiner Tätigkeit als Künstlerin ist. I’ll be in Bruges this weekend, and will keep a lookout for bookish items to show to you. I’m looking forward to try to speak a little Dutch while I’m there. I was told that they have a different pronounciation there than what am used to by my lessons (my teacher mainly practices in Ameland). We’ll see. My trials in Amsterdam yielded mixed results: Usually when I tried to speak to people in Dutch they would immediately switch to English, sometimes ask me to repeat what I just said. But one bus driver was so nice to ask me whether I am from Belgium and to seem honestly surprised and delighted when I told him I’m from Germany. They are nice people in Amsterdam! – That was when I was really tired, exhausted from a day of walking, wet to the bones from heavy rain, and I was not even trying to speak well. Maybe that’s the trick? Have a nice weekend all, and thanks for reading! It is time to pull the winners for my give-aways. I pulled from the 16 people who left comments on the first post on this blog. 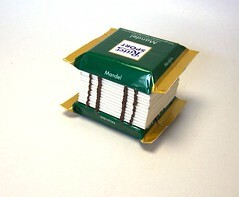 The material package goes to Robyn Tipton. And the process repeated yielded Julia from the Spotted Sparrow as winner of the Mini Ritter Sport Book. Congratulations to both! I already wrote you an Email to ask for your shipment details. Thanks to all who commented and thus helped to improve the layout of this page. I decided to keep the first banner for the moment. (Mainly because I am really fed up with coding and computers at this point.) I’m glad no one complained too much about it. On the long run I might change it to the second which I personally like better, and it got the most votes from you, too. I hope to see you all around and hear from you again! P.S. 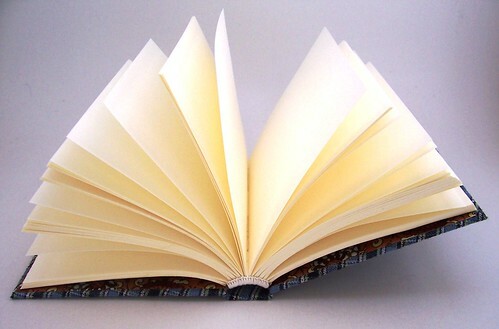 : I didn’t have the time to write an honest blog-entry about it, but just so that you don’t miss it, here’s a brief note: If you want to have a look at some exceptional nice pieces of book art, then check the Minneapolis Center of Book Arts Prize Finalists Page. 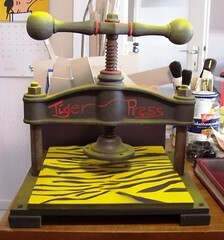 I’m finished with spraypainting my new tigerpress.